Letterpress print, in silver ink. Printed at New North Press in Shoreditch, London. The poster is printed on 280gsm Somerset Black Velvet which is 100% cotton and also acid-free. This is a beautiful letterpress poster, hand-printed with a visible impression in silver ink on archival black paper in a limited edition of 100 prints. It is designed in a Victorian style and, in combination with the subject matter, the poster has something of a steampunk feel about it. Prints are numbered by hand, in pencil, at the lower right in the form #/100. 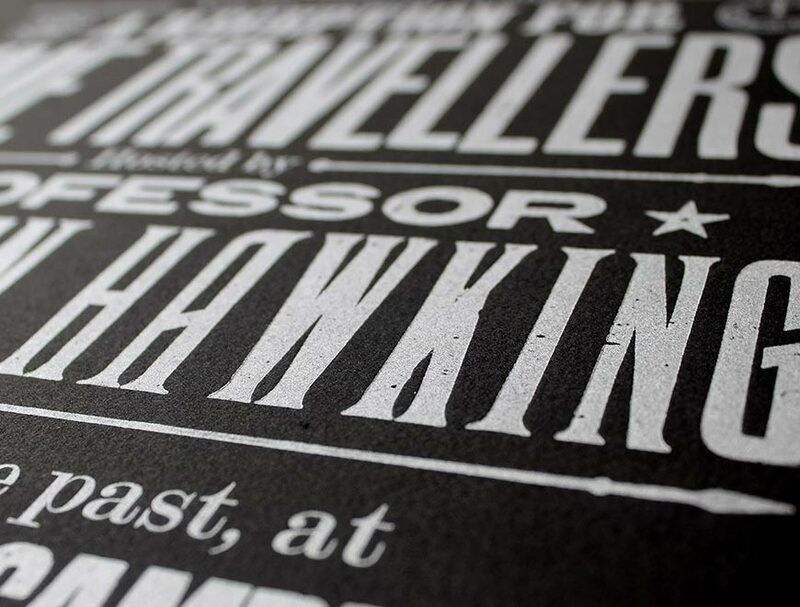 Each print also comes with a certificate of authenticity signed by Peter Dean and an information sheet containing the story of Hawking's experiment. Also available is a limited edition printed on handmade paper and a screen-printed open edition in two colours.